Finally I feel like I’m making progress on drama-watching! LOL. With the end of Dragon Gate and the final bunch of eps of Loved in the Purple, I can catch up on some other dramas!! (Although my original plan of just keeping to one ‘live watch’ drama kinda backfired since I only found out about Marry or Not yesterday! ><) This post feels shorter than usual because I had all these stuff I keep on adding to the Mr Chen section so in the end I just thought I might post separately for them. Otherwise, I’ll never get to sleep! The follow up drama Kiss Me Mom! (媽，親一下!) is based on a novel written by Giddens Ko. It’s about a family dealing with their mother having cancer. It actually sounds like a touching, family oriented sort of drama but neither the cast nor the story caught my interest so I will be skipping that one. The Pursuit of Happiness Eps 4 to 5 – Honestly I can’t recall having any particular strong feelings about episode 4 but episode 5? 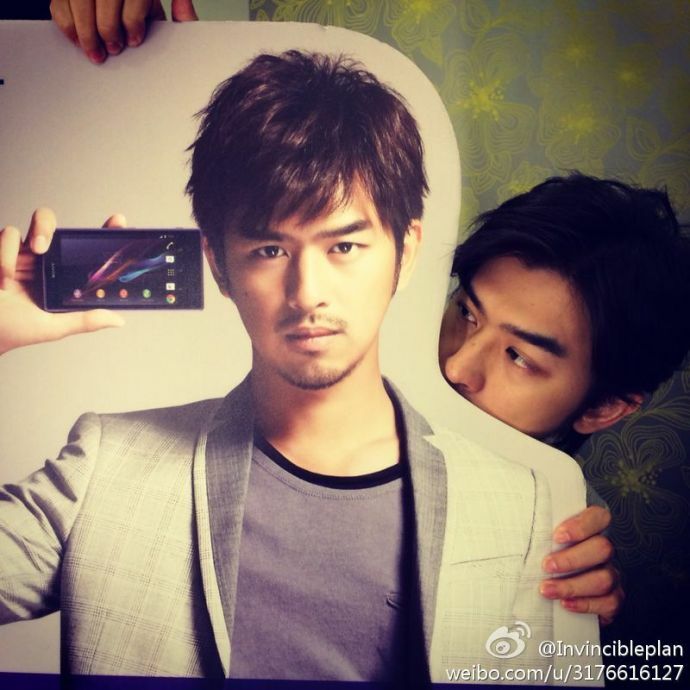 I LOVE ALL the An Lei x Yi Kang scenes! (especially the part where he puts carrots in the meal even though she absolutely hates it!) HOWEVER, once the story moves towards An Lei x Wei Ting (NO. My dislike for him just grows with each episode) and even the little side plot with Tiffany, I’m losing interest. The part with Tiffany in particular just felt it came out of nowhere. Helen x Yi Kang I’m okay with, there’s this ‘purity’ in their relationship which An Lei x Wei Ting doesn’t have. An Lei x Wei Ting’s ‘history’ just feels more like baggage, the kind you want to leave behind. I have to say though, Yi Kang is such a nice guy and unfortunately, girls do like bad boys HAHAHA. The follow follow up drama (according to Wikipedia anyway) to Dragon Gate sounds interesting – being Ruby Lin produced 回到初戀的夏天 (poorly translated to mean ‘Going back to the summer of the first love’). Not much details yet except it hasn’t started filming, and the only cast member confirmed so far is Ruby Lin herself. The story spans from 1998 to 2014, where the couple had opportunities to be with each other but keep missing them. The leading man was said to be Tony Yang, since he attended the TVBS drama launch press conference with Ruby back in May. But another news story from September talks about how difficult it had been for Ruby to find a leading man for this drama, since actors snubbed the idea of filming a Taiwanese drama. I guess this is nothing new, since Ady An also had the same problem while trying to find the lead actor for her drama and eventually found Mike He. Ruby is still filming another drama now right? And Tony has a part in The Crossing which is filming right now? I hope that doesn’t mean the ‘Summer’ series will be a rushed production since they only have 15 weeks until it’s supposed to air? This man is so busy right now I can’t keep up! Started putting things in here and realised it probably all needs to go in a separate post. >< I haven’t even gotten around to post pics from the Campus Confidential promotion function yesterday and today he attended a press conference for Sony Xperia Z1 which came along with lots of goodies. Not to mention he attended three fashion/award shows last week in Shanghai. I totally APPROVE of this scruffy look, even in print ads. The second one… hrm, I’m not sure about the hair? I’ve also included one of the ads below. MMM love the photoshoot with Tony & Sonia! I love Tony but I don’t think I could really picture him with Ruby. LOVE LOVE LOVE POH ep5!!!!!!! I’ve concluded that Lei Lei AND Hai Lun need to give up on Wei Ting pronto! I can’t find myself being too angry over the ending of Dragon Gate and I think that is in large part due to the song that was playing at the final meeting between Sunny and Tammy. Rene Liu’s 幸福就是 is very soothing. Really enjoying POH. No issues yet. I like the relationship that is building up between Sonia and Tony. As for Ruby’s new drama, she better find a really good male lead. I usually like stories that span over the course of years but based on the 2-sentence synopsis about a couple who missed opportunities to be together, it sounds like a real drag. I wonder if Ruby will find a male lead..her age? O_O” I mean, lately her male leads tend to be younger than her..
Yeah I guess they had been ‘trying’ to set up this ending from the start, at least the ‘love triangle’ wasn’t too messy. For the entire drama, it feels like they had the right ideas, but just poor execution. hmmmm so there’re some news articles in the past few days which mentions Tony is filming a series with Harwick Lau and Tiffany Tang at the end of this month? So he can’t be in Ruby’s drama?! That one has the same producers as Lanling Wang so looks like a bigger production. Guess we will have to wait and see who Ruby will actually be paired up with this time.